LION’S SHARE ist eine schwedische Heavy Metal-Band, die bisher sechs Alben und eine EP weltweit veröffentlicht hat. Die Band tourte durch Europa mit weltbekannten Größen wie Motörhead, Manowar, DIO, Saxon, Iced Earth, Nevermore, U.D.O., Dee Snider und spielte auf vielen der wichtigsten und größten Festivals. Der LION’S SHARE Album-Katalog zeigt Auftritte von Mitgliedern und Ex-Mitgliedern von KISS, Megadeth, King Diamond, HammerFall, Opeth, Symphony X, Chimaira, Therion, Yngwie Malmsteen, Candlemass. Die Alben wurden von Top-Produzenten wie Jens Bogren (Arch Enemy, Opeth, Symphony X, Sepultura, Kreator, Amon Amarth), Niklas Flyckt (Grammy-Preisträger und 4 Mal nominiert für den Grammy), Ronny Lahti (Roxette, Europe, Glenn Hughes, Electric Boys) und Robert Wellerfors (The Rolling Stones, Joey Tempest, Eagle-Eye Cherry, Ace Of Base). gemischt. LION’S SHARE ist fest entschlossen, ihren Herzen und nicht den aktuellen musikalischen Trends zu folgen, wenn es um ihr Songwriting geht. Eine Haltung und ein Ansatz, der der Gruppe selbst viel mehr persönliche Erfüllung gibt. Es ist die Hoffnung und der Glaube der Band, dass die Aufrichtigkeit und die Leidenschaft, die sie in ihre Musik einbringen, ihnen letztendlich dabei helfen werden, ihr Publikum zu finden und dem Quintett die Anerkennung zu geben, die sie verdienen. LION’S SHARE is a Swedish heavy metal band that has so far released six albums and one EP worldwide. The band have toured Europe with bands like Motörhead, Manowar, DIO, Saxon, Iced Earth, Nevermore, U.D.O., Dee Snider and have played many of the major festivals. 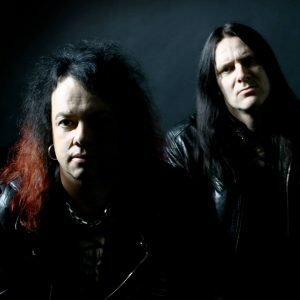 The LION’S SHARE album catalogue features appearances by members and ex-members of KISS, Megadeth, King Diamond, HammerFall, Opeth, Symphony X, Chimaira, Therion, Yngwie Malmsteen, Candlemass. The albums were mixed by top engineers such as Jens Bogren (Arch Enemy, Opeth, Symphony X, Sepultura, Kreator, Amon Amarth), Niklas Flyckt (Grammy award winner 1 time and nominated 4 times), Ronny Lahti (Roxette, Europe, Glenn Hughes, Electric Boys), Robert Wellerfors (The Rolling Stones, Joey Tempest, Eagle-Eye Cherry, Ace Of Base). LION’S SHARE is firmly committed to following their hearts and not the current musical trends when it comes to their songwriting, an attitude and approach which the group themselves find much more personally fulfilling. It is the band’s hope and belief that the sincerity and the passion which they pour into their music will ultimately help them find their audience and provide the quintet with the recognition that they deserve. Sabbath, Saxon and Megadeth – don’t miss out! but one big angry beast! One helluva return indeed!